Travis Pastrana’s Nitro Circus Live at K1 Speed! Nitro Circus Live is coming to Orange County for one performance only and K1 Speed is the place to race for the chaos! Join Chris Haffey, Dusty Wygle, Kurt Nicoll, Jarryd McNeil and Nate Adams from Nitro Circus for some electric motorcycle mayhem! 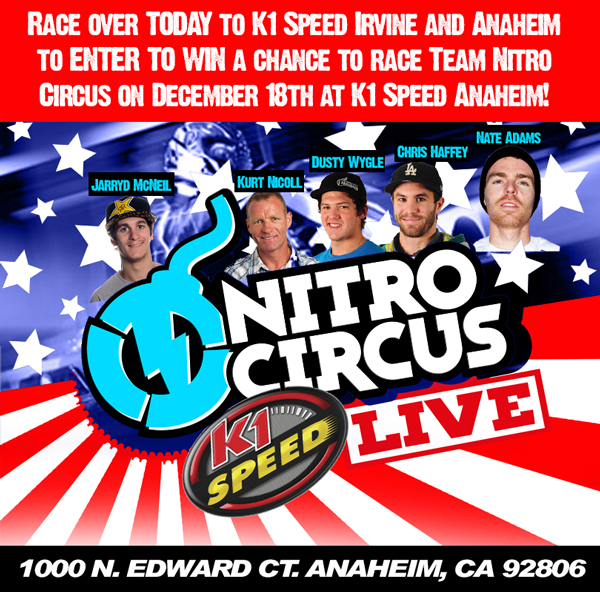 Race over TODAY to K1 Speed Irvine and Anaheim to ENTER TO WIN a chance to race Team Nitro Circus on December 18th at K1 Speed Anaheim! The winner of the race will receive VIP tickets to see Nitro Circus Live at Honda Center on January 26th! Nitro Circus founder, ringleader and world-class athlete Travis Pastrana will bring Nitro Circus Live (www.nitrocircuslive.com) – the action sports spectacle that has become a worldwide hit – to Honda Center for the first time on January 26, 2014. Nitro Circus Live showcases over 40 of the world’s best action sports athletes performing daring and often record-breaking tricks in freestyle motocross, BMX and skateboarding, along with heart-stopping stunts on unique contraptions rarely attempted outside of the Nitro Circus family. Featuring the stars of Nitro Circus’ hit MTV2 show and Nitro Circus 3D film, the tour is headed up by Pastrana, a 10-time X Games gold medalist in Freestyle Motocross who has also become a fixture on the NASCAR, Supercross and rally racing circuits. Originally a small DVD series filmed in Pastrana’s Maryland backyard, Nitro Circus grew into a successful MTV show with over 46 million U.S. viewers and broadcast in 60 countries worldwide. The next step was Nitro Circus Live, which has captured the imagination of fans worldwide with a string of sell-out shows and record-breaking crowds across Europe, Australia and New Zealand. “I’m so pumped we can finally bring this home for fans to enjoy,” says Pastrana.